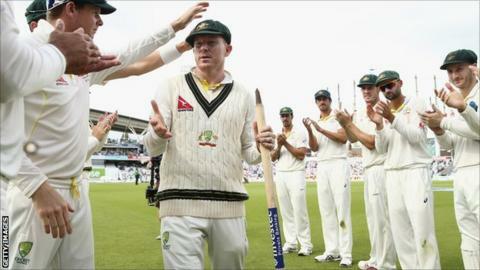 Somerset director of cricket Matt Maynard has hailed the arrival of former Australian opener Chris Rogers as a marquee signing for next season. Rogers, 38, will play in next season's County Championship and Maynard is delighted with the signing. "He has agreed to come in and bat at three for the summer and that's a real top signing for us, a marquee player," Maynard told BBC Radio Somerset. "He is a great acquisition, I'm really looking forward to working with him." Maynard says the Sydney-born left-hander will be a huge asset to the side and will help support the opening duo of Marcus Trescothick and 21-year-old Tom Abell. 50 - Chris Rogers has recorded a first class batting average of 50+ in 10 of the 12 years he has played in England. "I think it was quite evident that apart from Marcus and Tom at the top of the order, we needed a bit more stability at three. "He's got a world of experience, he is still very athletic, he is a very fit lad, he has got that Aussie determination, that steely quality and we saw during the summer he is a high-class player on tough wickets." Rogers announced his retirement from Test cricket prior to this summer's Ashes series and Maynard hopes his experience can help the younger members of Somerset's squad. "We can't stifle our young talent and ask Tom Abell to bat out of position. He has established himself as an opener, he still has a long way to go but has the potential to go all the way and bat for England for a number of years. "Obviously Marcus is still at the top of his game. Chris has batted at three a number of times in his career and is happy there. Also it will give him time to bed in, he is a quality performer and we're hoping for an excellent season from him."